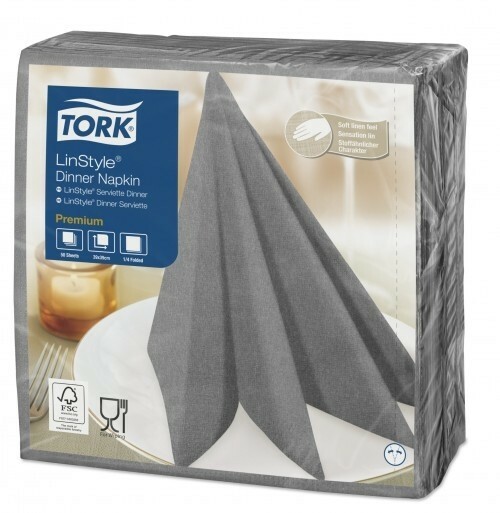 These Tork Linstyle Grey 8 Fold Dinner Napkins support full-service restaurants, where quality is especially important to impress your guests. With the look and feel like real textile, each napkin is noticeably softer and bulkier than standard paper napkins, while being extra absorbent. Give your customers the elegant experience of a linen napkin. Avaliiable in a wide range of modern and classic colours. Looking to buy some Tork Linstyle Napkins 8 Fold 39cm? If you would like some advice on purchasing Tork Linstyle Napkins 8 Fold 39cm, simply contact our expert sales team, giving us either an email or phone number on which to contact you and we'll get back to you with the best advice or contact us by email: [email protected] Phone: 020 8424 8886.